Fall is an exciting time for Girl Scouts, as new girls join, new troops form, and returning members recommit themselves to the Girl Scout Promise and Law. Each is marked by a special ceremony, either an Investiture or a Rededication. Both are beautiful rituals that have been performed since the earliest troops met. But too often, once the ceremony ends, mothers rush over to the leaders and immediately begin arguing. The issue? The dreaded Rededication Rocker – the iron-on patch reading “First Year,” “Second, Year,” etc. Let’s set the record straight about Rededication Rockers. Rededication Rockers first appeared in the 1999 patch catalog. First, Rededication Patches and Rockers are not official insignia, like the Girl Scout pin, Council ID Strip, or even the troop numerals. They fall into the same category as cookie patches and event participation patches and go on the back of the uniform sash or vest. Look at the girls in the latest Girl Scout Catalog. Are any of them wearing Rededication patches? Do you even see Rededication patches listed for sale? No. 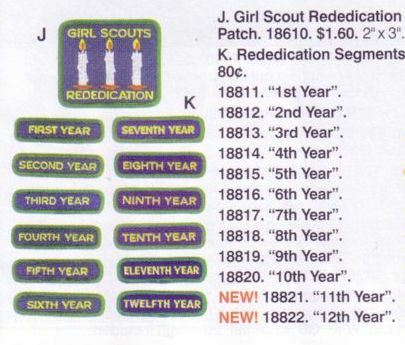 With the exception of the 2004 catalog, Rededication patches have not been included; they have been offered in separate “Fun Patch” catalogs. When Daisies expanded to Kindergarten, new 11th and 12th year rockers were added to the 2004 catalog. Second, Rededication Patches and Rockers are optional. The uniform police aren’t going to come after you if your troop decides to skip them. And even if you do pass them out, Ambassadors really don’t need a huge row going back to their birth. Personally, I don’t think it’s a wise use of resources; a dozen rockers take up a lot of acreage on a teen vest, and at $1.75 each, I don’t think a troop should spend funds on patches “earned” six or seven years ago. If it’s that important, parents can buy the whole series. A new design was introduced in 2006. Third, because they are not official insignia, Rededication Patches and Rockers do not have requirements to earn them. 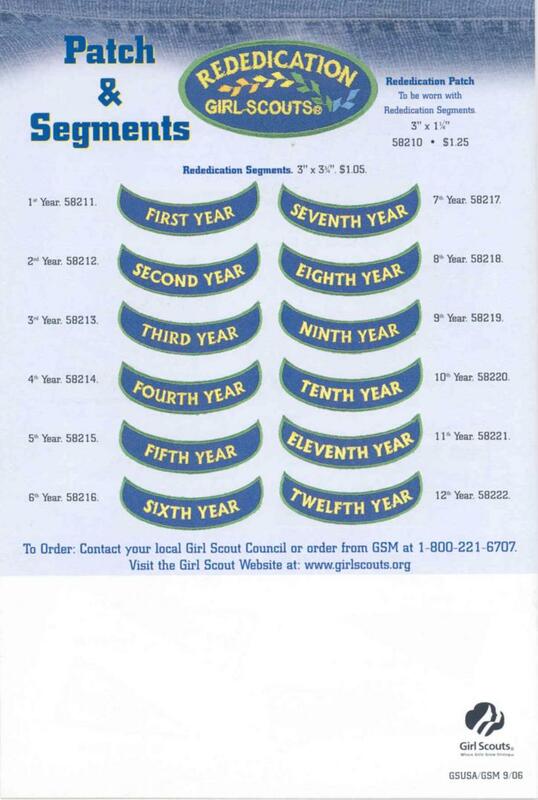 If a girl commits to another of Girl Scouts by reregistering, that’s sufficient for me. If she can’t make the rededication meeting, but comes later and asks, I’ll give her one. I’m just happy to have her back for another year. Fourth, Rededication Years are one less than membership years. This is my biggest complaint about Rededication Rockers, the annual debate over what year a girl should receive. When you join Girl Scouts, you are invested; when you re-up for another year, you rededicate. Your second year as a Girl Scout is the first time you have a Rededication Ceremony; therefore, it is year one. OK, let’s try it this way. If you believe that a returning first grader would receive a Year Two Rededication Rocker, then when she hits 12th grade she should receive a Year 13 Rocker, right? Wrong!! There is no Year 13 Rocker. Now do you believe me? There is way too much drama about who gets what scrap of fabric at a Rededication Ceremony. Let’s keep the attention on the real meaning of Rededication. She came back!!!! Isn’t that enough reason to celebrate? This entry was posted in Badges, Events and tagged #girlscouts, Girl Scout, Girl Scout badges, Girl Scout Council of the Nation's Capital, Girl Scout history, Girl Scout memorabilia, Girl Scouting, Girl Scouts, Girl Scouts of the USA, GSCNC, gshistory, GSUSA, rededication. Bookmark the permalink. Thanks for writing all of that out – it’s so much clearer to me! I didn’t even realize there were rocker patches, lol. That was a great explanation! I didn’t even realize that those rocker patches were for to be used with the bigger patch, lol.